The Fleet Air Arm flew a number of different types of aircraft during WWII. Some were specifically designed for them, while others were adapted for use. This sheet covers many of those types. 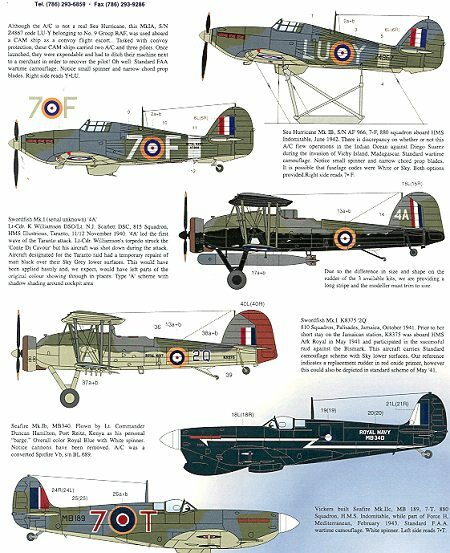 Now while there are not always specific kits available for some of these, there are some conversion sets around and others are simple enough for even the newest modeler to have a go at it. Most of the planes are in standard camouflage of Dark Sea Grey and Slate Grey over Sky. Fuselage bands are supplied on the sheet but you may want to paint them on. 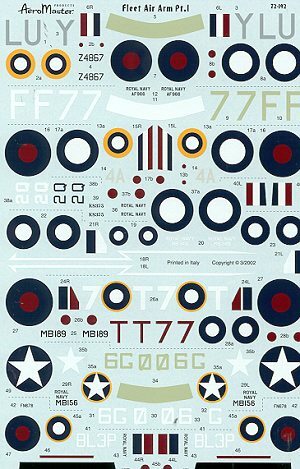 There are insignia for all of the aircraft on the sheet in case you decide to build them all! First is a CAM Hurricane Mk.IA. This is a standard RAF Hurricane fitted with catapult attachments for use on CAM merchantmen. You note that there is no tail wheel. Often when these planes ran out of fuel, there was no place to land but the ocean. Fortunately, most pilots survived! Next is a Sea Hurricane IB of 880 Sq aboard the HMS Indomitable in 1942 during Indian Ocean operations. The Swordfish I that is next has a black underside. This 815 Sq aircraft participated in the Taranto raid of 1940 against the Italian fleet. From 810 Sq is this red oxide primered-tailed Swordfish I while based in Jamaica during 1941. Prior to that, this aircraft participated in the attack on the Bismark. To build that version, simply paint the rudder in normal colors. This Royal Blue Seafire Ib was flown by Lt.Cdr. Dunan Hamilton while based in Kenya. The cannon have been removed from this plane. The Seafire IIC of 880 Sq was part of Force H in the Mediterranean during early 1943. From 885 Sq is this Seafire IIC which participated in Operation Torch in late 1942. Finally a Kingfisher I of 768 Sq when based in the UK during 1943. There are a number of good kits available to use for these aircraft. Any will add a bit of zest to the usual WWII aircraft collection.